BOSTON, MA -- (MARKET WIRE) -- October 24, 2005 -- Thursday, Nov. 10, at 10:00 a.m. 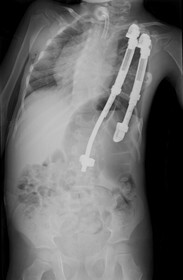 ET (15:00 UTC) , surgeons at Children's Hospital Boston will implant a vertical expandable prosthetic titanium rib (VEPTR™) in a pediatric patient during a live webcast. The webcast available at http://www.OR-Live.com/childrenshospitalboston/1359 is part of Children's ongoing effort to bring its cutting edge care and technology to specialists and referring physicians around the world and allow consumers to see the latest and most innovative medical treatments available. Moderating the live broadcast will be James R. Kasser, MD, Orthopaedic surgeon-in-chief and professor of Orthopaedic Surgery at Harvard Medical School, and Daniel J. Hedequist, MD, a spinal surgeon at Children's with expertise in congenital spine deformity and experience with titanium rib implantation. Drs. Emans, Kasser and Hedequist will answer e-mail questions from viewers during the live broadcast. VEPTR™ is used to treat TIS, a condition caused by congenital or early onset scoliosis or by hypoplastic thorax syndromes. Deformities of the chest wall, rib cage and spine developing in young children can restrict lung growth or complicate breathing, resulting in TIS. The VEPTR™ procedure addresses both chest wall and spine deformity directly. After initial implantation, the VEPTR™ devices are periodically expanded, allowing growth of spine, chest and lungs. Once implanted, the titanium rib, produced by Synthes, Inc. (VTX: SYST.VX), both stabilizes the spine and expands the rib cage to allow for increased lung space. Join Children's Hospital Boston surgeons<br> in a live webcast of a VEPTR(TM) procedure on Nov. 10th.